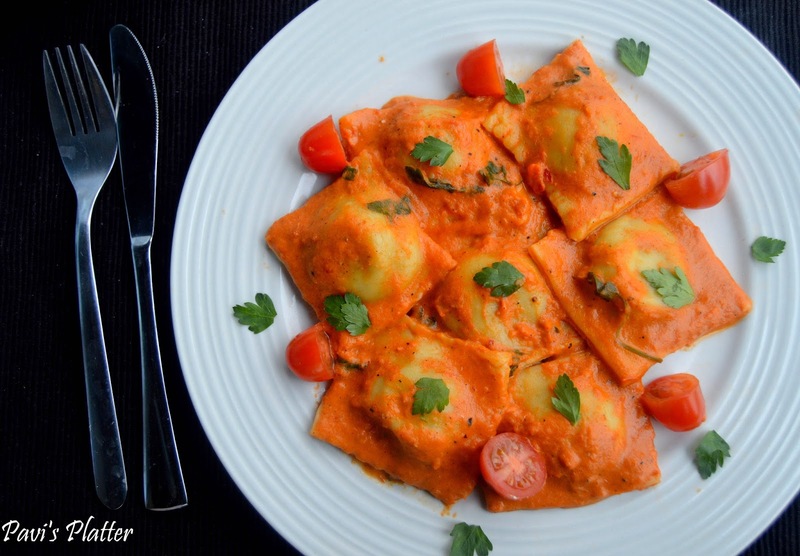 Pavi's Platter: Spinach Ricotta Ravioli in Roasted Pepper Sauce ! 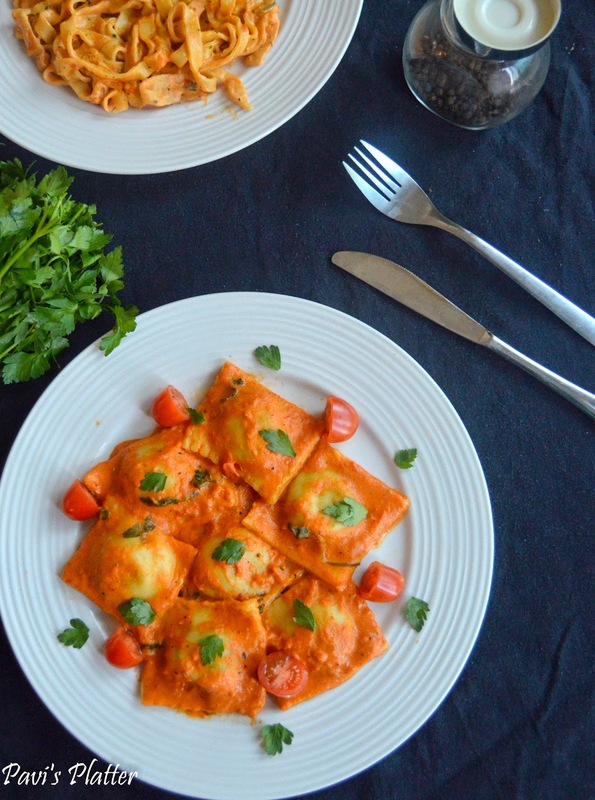 Its been a long time wish to try ravioli from scratch and blog it here. First time I made was with a bell pepper and cheese filling ravioli in a butternut squash sauce. 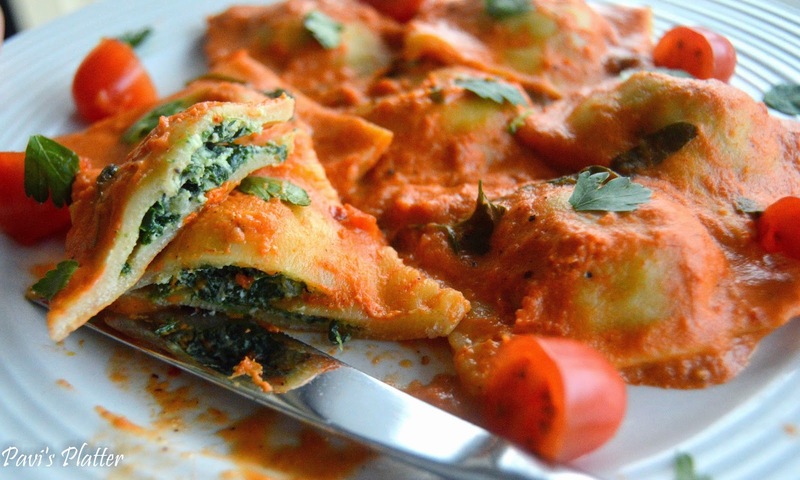 My friend Gayatri wished for a Spinach ricotta ravioli and we got a chance to cook and click together. It is always fun to cook with friends and best part is when you have someone to click the pics when your hands are messy kneading the dough. Note : To make it veg/vegan, just skip the egg and just use water to make dough. BUt make sure you dont add so much water and make it sticky. The dough should resemble chapati dough. Also few spoons of flaxseed powder can be added to the dough. In a bowl, break the eggs and add 1/4 cup water and mix well. Take the flour on a big tray or counter top and make a dent in it. Pour the egg water mixture in the dent and add required salt. Slowly mix the flour little by little using a spoon in to the egg mixture. Once most of the flour is incorporated into the egg, its time for the messy work. Use your hands and mix all the egg and flour together and make a dough. you got to knead it very well until it becomes soft. Add the olive oil and again knead the dough for 5 minutes. You can see how soft the dough is in the below picture. 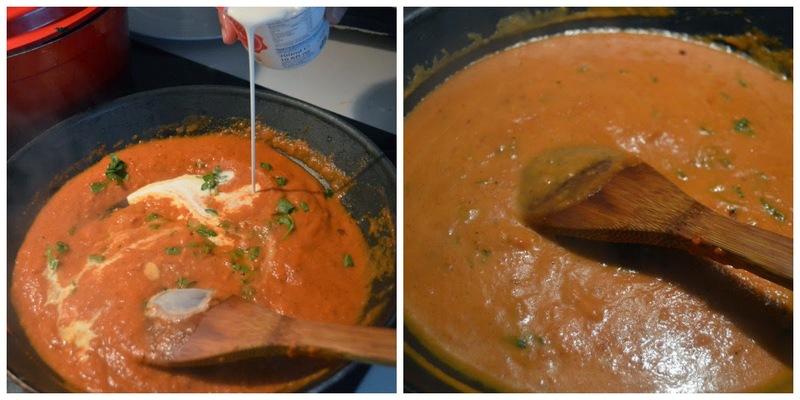 Cover it with a cling wrap and let it rest in the fridge until you make the filling and the sauce. The general thumb rule for flour to egg ratio is, for every 100 gms flour you need an egg. Dont compromise with it. If egg is less your dough will be very very dry and crumbly. If the egg is more then your dough will be too sticky to handle. Halve the peppers and remove the veins and seeds. Chop onion and peel garlic. Rub oil on the peppers and sprinkle some salt and pepper. Drop some oil in the onions and garlic and add salt and pepper to that as well. Roasting onion and garlic is optional , you can saute them as well. You can even saute the bell pepper too. BUt roasting gives a nice flavor to the sauce. Roast the peppers and onion garlic in a preheated oven for 20 - 25 minutes at 200 deg C.
Once the bell peppers are charred remove them from oven and let them cool. Cover them in a cling wrap and after sometime you can easily peel the skin. Remove all the skin and grind them all to a smooth paste. You can also use store bought roasted peppers that comes in a jar. In a pan, add oil and once hot add the chilli flakes. Then pour the ground mixture and add some water. Let it come to a boil and then add parsley. Pour the cream and mix well. Turn off stove. Your sauce is ready ! Keep aside until use. Note : Instead of Ricotta, mozarella, cheddar, edams or any cheese can be added. 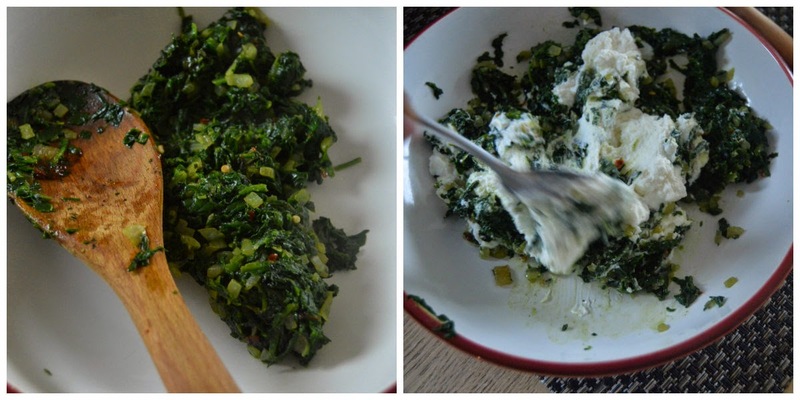 You can also add some grated parmesan to the spinach and ricotta mix. In a pan, add olive oil and once hot add the chopped onions. Saute them until they turn translucent. then add the chopped spinach. Saute the spinach for 2 - 3 minutes till they shrink and reduce in quantity. Add salt, pepper and chilli flakes and cook till all water is evaporated. Once the spinach is cooled, mix the ricotta and keep the filling ready. Remove the dough from fridge and make it into four parts. I am using ravioli maker here with which we can make many raviolis at a time and also of the same size. You can make the same with hand as well but its little time consuming. I have explained both the methods below. Take one part of the dough and roll it into a long sheet. Roll it as thin and even as possible. Spread the dough sheet on the ravioli maker as shown in first pic. Keep a spoon of filling in each of the pits as shown. Now roll another sheet of dough and place it on top of this. Press well on the sides and spread some flour on top. Now cut off the excess dough on the sides and then just invert the ravioli maker on a work surface. You can see how nice the raviolis are... quick and easy.. Using a pizza cutter, cut into separate pieces as shown. Fold the sheet as shown and secure the filling by pressing the dough around the filling. Now, cut the raviolis into separate pieces and make sure everything is of same size. Now, with a fork press the sides of the ravioli carefully, it secures the filling as well as results in a nice fancy design. In a pot, bring lot of water to boil and slowly add a batch of raviolis. In 4 - 5 minutes they get cooked and start floating on top. Thats the indication that they are cooked. Also they turn shiny once cooked. Take them out and keep aside. After using the ravioli maker, the excess dough you cut off from the sides can also be again kneaded and used to make raviolis by hand. Keep the other portion of dough covered in cling film when you are working with one portion. Else the dough will turn dry. 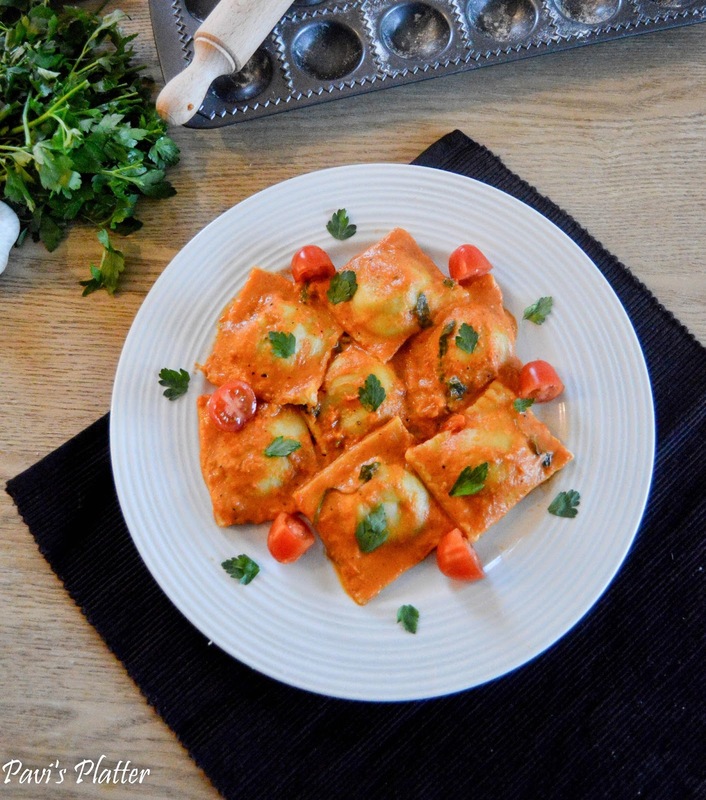 Now arrange the raviolis in a plate and pour the sauce on them. Sprinkle some parmesan(optional) and some parsley and serve. ! Thanks Supriya. ! Yes it is time consuming but not so hard except or making perfect pasta dough. Do try and let me know. THanks Sri for stopping by ! Thank you dear Nusrath.. Will chk out for sure. ! THanks.. Yes you can just make dough with water and some flaxseed powder. SInce many people had the same doubt i updated the same in the post. THanks.. Nothing s better than home made food.. do give a try and let me know! Very tough recipe and looks yummy. keep going. WElcome Kanchan ! Do try and let me know ! This is really awesome. We had a lovely dinner yest. We all loved it. I couldn't believe my eyes wen d whole bowl was empty in no time. Thnx a lot for such yummilicious dish. THanks Surbhi! Im really glad that you tried this and your family enjoyed it ! Thanks Pavi ji, it turned out amazing. But I have few doubt's, when I put ravioli in boiling water it floats on the surface only and doesn't goes inside as told by u. Also while I serve it, it gets cold in 2 minutes only. What could be the reason. Masala vadas (No deep fry) !